Ben Affleck Takes Fans For A Spin In The Batmobile! Imagine you’re taking a tour of the Warner Bros. lot when the Batmobile pulls up alongside and Ben Affleck offers to take you for a spin. Well, that’s what happened when Affleck surprised a number of tour groups. The publicity stunt was in support of an Omaze campaign connected to Batman v Superman: Dawn of Justice that supports three non-profit organizations nominated by Affleck, Cavill and Eisenberg: Affleck’s own Eastern Congo Initiative, the SEED Project and the Durrell Wildlife Conservation Trust. Fans can enter a sweepstakes to attend the premiere of Batman v Superman: Dawn of Justice. Follow the jump for details. Star Wars: Force For Change: This Is My New Favorite Star Wars Moment! 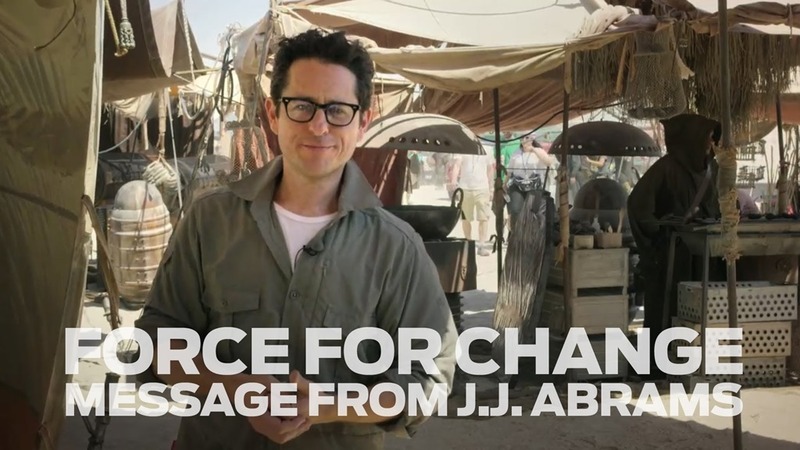 Remember J.J. Abrams’ message from the set of Star War Wars: Episode Seven, about raising funds for the United Nations Children’s Fund (UNICEF)? Star Wars: Force For Change has raised nearly 4.3 million dollars The funds raised will support ‘the equivalent of 7-8 new Innovation Labs to aid children and familes. Star Wars: Force For Change had a unique idea for prompting donations – one lucky donor would get to be in Star Wars: Episode Seven. Follow the jump to see D.C. Barns of Denver, Colorado learn he’s the Grand Prize Winner.